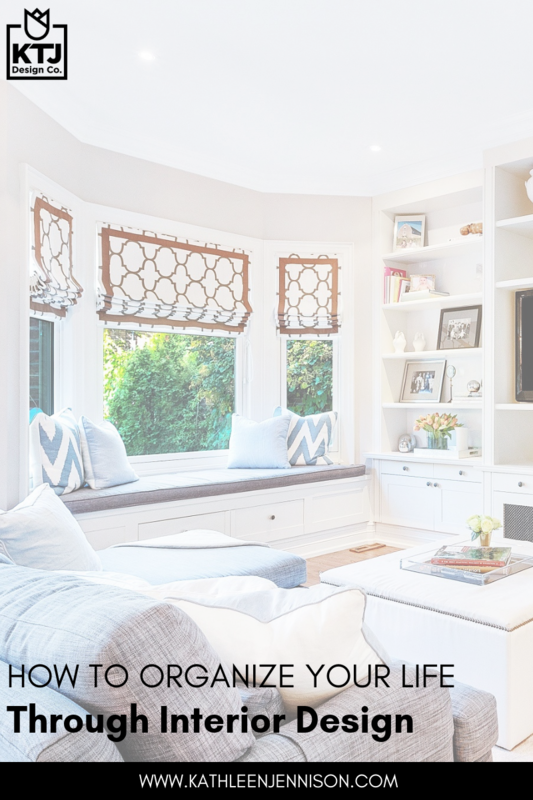 How to Organize Your Life Through Interior Design — KTJ Design Co. I grew up with an alcoholic, drug addict father. My childhood was chaotic, to say the least. I craved a sense of order so badly that I started my first career in a profession that is steeped with rules and regulations: accounting. I chose interior design as my second career partly because my childhood home(s) were always a mess and disorganized. Heck, we even lived in a tent for one year (I guess that made us homeless by today’s standards!) Because of this, I have a deep desire to give everyone a beautiful AND organized home. I think many people hate their homes for the simple reason is that it is not organized. You totally understand me. I know you do. With your busy career, crazy sports schedules, and trying to plan what to cook for dinner, the last thing you want to do is waste time looking for the little guy’s lunchbox in the morning. The best way to incorporate organization into your home is to have a place for everything. This is more than having cute plastic cubbies and bins everywhere; this means making it easy to put things back where they belong. We ask a lot of questions when we begin your design. First, we have you complete a questionnaire. Second we spend an intensive 2 hours in your home, picking apart every nook and cranny with your help. We’re not voyeurs being nosey; we really want to know how you store your pots, pans, dishes, spices, cutlery and so on. We want to know how you use each room and every inch of your space. Pay attention to what goes on the inside your cabinets. 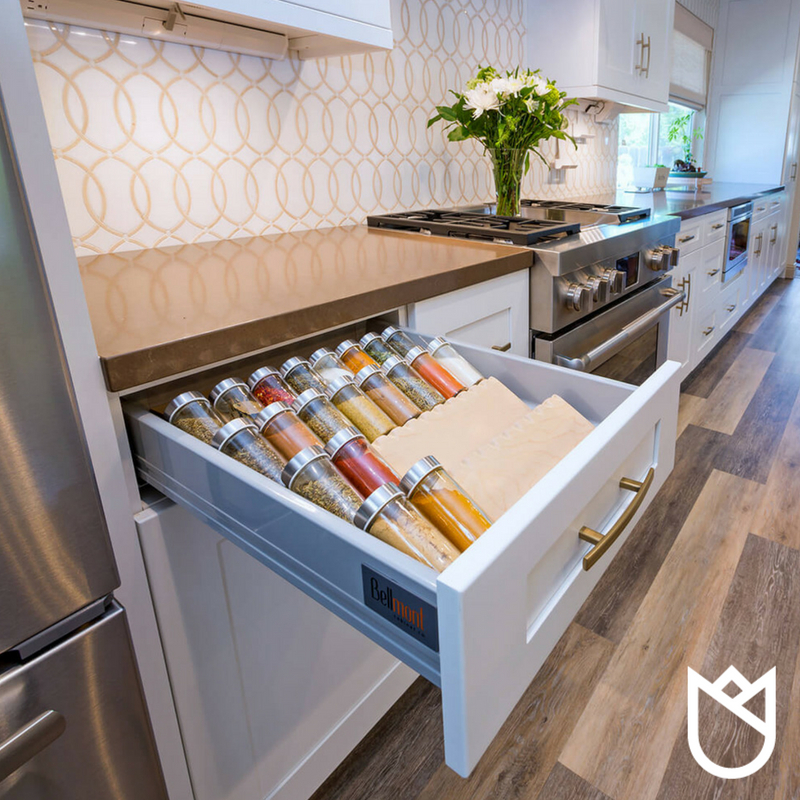 You’ll need roll-outs to maximize shelf space, pot and lid organizers, spice racks, utensil trays, trash bins, and more. The important thing is to make sure the flow of the kitchen works for you and your family (and that’s our specialty). Having the blow dryer and curling wand on the vanity top is so annoying! We try to incorporate grooming organizers inside all our vanities. Each vanity comes with stainless steel round bins for the blow dryer and curling iron (and the plug is right there, too). This is the ultimate in clutter-free bathroom storage. Tilt-out wire hampers are the best for keeping laundry at bay. We like to design the laundry room with three separate bins (whites, darks, and colors), making it easy for you to toss a load of presorted clothes in the washer. We like to hang the TV on the wall with an oscillating arm. Our electrician puts in an electrical box to make this happen without a mess of dangling cords (and we suggest getting a wireless cable box to hang behind the TV). These are just a few of the designer tips we give our clients and like to incorporate in our designs. Now, if I could only rule the contractors and freight companies, we’d all have it made!! Ready to Get Organized? Book a Discovery Call Now. Kathleen Jennison April 2, 2019 The Shoppe at KTJ Design Co.
Kathleen Jennison March 19, 2019 Kathleen Jennison Inc., dba KTJ Design Co.